There is exceptional value to be found in the pages of The Square's far-reaching wine list - the set lunch is also a steal. 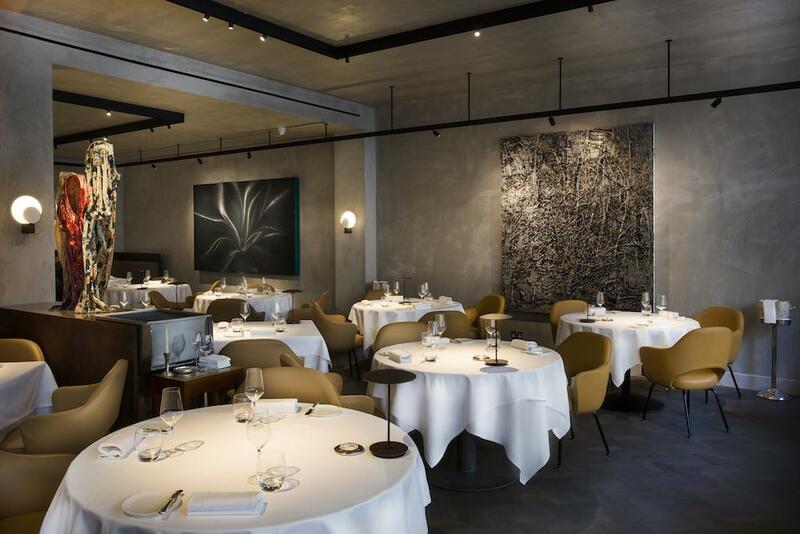 Located amid Mayfair’s galleries and auction houses is the gallery-like dining room of The Square, featuring boldly wrought square canvases on its anthracite coloured walls. Head sommelier, Andrea Zarbetto (formerly of Morton’s Club, which is also owned by Marlon Abela, CEO of MARC, along with Umu, The Greenhouse and wine merchant, OW Loeb) oversees an actually square-shaped list running to more than 2,500 references. These begin at just £25 for a bottle of Picpoul de Pinet, with circa 60 wines offered by the glass. Costing a fiver less than Moët & Chandon’s Brut Imperial, “the most popular wine is by the indie Champagne producer, Goutorbe Boillot: Reflets de Riviere Brut, Damery,” notes Zarbetto. Dishes are beautifully realised by conjugal team, Clément Leroy from France’s Chantilly, and Aya Tamura from Tochigi, Japan, and may include Devon crab and sea urchin potato cream, foie gras in beeswax with blood orange and juniper, and roe deer and burrata with blackcurrant jus, possibly followed by whisky millefeuille with Tahitian vanilla and a glass of Riesling Auslese from the Mosel (Schloss Lieser). In his low-lit cellar, kept to a constant 14° Celsius, Zarbetto, who is also a self-confessed fanatic of gin and Calvados, often leaves his own infusions to mature, such as the house-made Amaro. This gradually matures alongside flights of La Mission-Haut-Brion, Comtes Lafon, Mas de Daumas Gassac and d’Yqeum, as well as magnums of Bric dël Fiasc Barolo and Solaia. New listings include Gravner, sweet Veyder-Malberg, and clay bottles of Sepp Muster. Perhaps in honour of Abela’s country of birth, there are wines from Lebanon (Château Marsyas and Château Belle-Vue) as well as neighbouring Syria (Domaine de Bargylus). Also of interest, are the selection of “flawless” Syrahs from South Africa (Cuvée Ameena, Vins d’Orrance). Located amid the galleries and auction rooms of Mayfair, the refurbished, gallery-like, chic dining room features boldly wrought square canvases on its anthracite coloured walls. The Square’s actually square shaped but encompassing wine list runs to 2,500 references, being a miscellany of the great and the good of the global wine world, with circa 60 wines offered by the glass, often served in if not square, notably angular stemware. Light and even healthful seeming dishes, beautifully realised by husband and wife team, Clément Leroy and Aya Tamura, feature, aesthetically, more rounded details than the strictly realised environment. Head sommelier, Andrea Zarbetto, who has prescribed and cared for the wines here since 2014, was formerly at Morton’s Club, which is also owned by Marlon Abela, CEO of MARC, along with Umu, The Greenhouse, The Square, and reportedly briefly imperilled wine merchant, OW Loeb – a specialist in Germany, Burgundy and the Rhône. As well as the Mouton, there are flights of Lafleur, Pétrus, Domaine de la Romanée-Conti, Coche-Dury, as well as delightful curios, such as the 100% Pinot Blanc Champagne, ‘Roses’ by Cedric Bouchard, and some beautifully drinking heritage Australians, such as Astralis (Clarendon Hills) from the late 1990s as well as, perhaps honouring Abela’s country of birth, wines from Lebanon, as well as neighbouring Syria. Also of interest, are the selection of sweet Vouvrays (Huet) and Château d’Yqeum reaching back to the 1950s – part of a rich selection of sweeties to chime with Tamura’s intricate puddings, which may also include Ornus dell’Ornellaia, and even a Licor de Tannat from Uruguay. There is a real sense of value if you look for it, including Premier Cru Chablis from nearly Grand Cru grade mini mountain, Tonnerre, for example, as well as lush wines by impeccable operation of Domaine Denis Mortet. This is a dining room where non trust fund diners could enjoy a decent white Bordeaux too for £40 with some bottle age (Château Loudenne) or an English Bacchus from Kingscote. And, for around £35, there is good liquid from Paardebosch’s David & Nadia Sadie, and even the odd half bottle for below £20. For a restaurant of this level, the set lunch is a relative snip being below £40 with plentiful canapés and petit fours, as well as a Maldon salt enriched chocolate bar which diners are invited to filmically smash with a metal hammer. Dishes could include a foie gras panna cotta with almond cream, daikon, plum dressing and an additional glass of Wolfer Goldgrube’s late harvest Mosel Riesling, then braised beef cheek tortellini with grilled octopus, beef jus, chive oil pepped by a slightly chilled Provence red (Château la Calisse Coteaux Varois), followed by warm chocolate cake, molten gingerbread, blood orange sorbet and, a survivor from the 1980 harvest – Valencian Vino de Licor Moscatel. Reams of fantastic vintage Champagne, with special focus on Selosse and Billecart- Salmon – are available if you have the spondulicks, while the most celebrated appellations of France, Italy and Spain are exhaustively covered. The glass listings are particularly compelling, including novel listings such as Vacqueryas Blanc (Domaine Monardiere) and accessible claret in the form of Brane-Cantenac second wine Baron de Brane. Patrick Javillier Clos du Cromin Meursault and Domaine Arlaud Gevrey-Chambertin are also among current wines being poured by the glass, ensuring you don’t need to wade into a bottle to appreciate loftier appellations. There’s a healthy listing of older vintages of Domaine Trimbach, too.